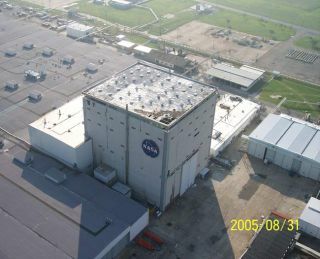 Hurricane Katrina left holes in the roof of the Vertical Assembly Building at the Michoud Assembly Facility near New Orleans. The timingof NASA's next shuttle launch remains uncertain as the space agency works torecover key facilities from the aftermath of Hurricane Katrina, agency officialssaid Thursday. In additionto spreading widespread devastation across the Gulf Coast, Hurricane Katrinadamaged NASA's external tank-producing Michoud Assembly Facility in NewOrleans, as well as Stennis Space Center, where shuttle main engines aretested, in Mississippi. While some NASA officials still hope to launch around March 2006, they were unable to complete a feasibility analysis for that target before the hurricane struckthe Gulf Coast last week. "We're in the process of evaluating it," William Gerstenmaier,NASA's associate administrator for space operations, said of a possible spring launch during a teleconference with reporters. The updatefollowed reports of an internal Sept. 1 memoby Wayne Hale, NASA's acting shuttle program manager, in which he suggestedthat "launch dates before fall  may not be credible." "Rightnow, we're still addressing what the implications are on the shuttle launchschedule, and if I say I don't know what those are, that's anunderstatement," NASA chief Michael Griffin told employees in a televisedaddress, according to the Associated Press. Gerstenmaiersaid Hale's note was a very preliminary paper used to discuss some of theinitial points raised by the hurricane. Hale, himself, labeled the memo "extremelypreliminary," according to the document. "It'sreally too difficult to predict," Gerstenmaier said of future shuttle launchdates. Gerstenmaiersaid NASA set aside about $1.1 billion - $500 million for Michoud and $600million for Stennis - to aid recovery efforts at the two sites. But those fundswere based on preliminary damage estimates based on photographs and the spaceagency's past experience with hurricanes at Kennedy Space Center (KSC) inFlorida, he added. In additionto damage at both facilities, up to 900 Stennis employees have lost theirhomes, said NASA's William Parsons, who is spearheading the agency's hurricanerelief effort. Almost 4,000 people were evacuated to Stennis Space Center whenHurricane Katrina hit, he added. All of the Stenniscenter's civil servants have been accounted for, as well as 95 percent of itscontractor personnel, Parsons said, adding that Lockheed Martin is stilltracking down about half of its 2,000 employees at Michoud. The 15 NASA employeesstationed at the New Orleans facility have been accounted for, he added. NASA's nextshuttle flight depends on when engineers solve a foam debris shedding problemobserved during the July 26 launch of the space shuttle Discovery. A 1-poundpiece of foam insulation fell from a protective ramp on Discovery's tank duringlaunch. While that chunk of foam did not strike Discovery, a similar sheddingevent did strike the space shuttle Columbia during its ill-fated 2003 launch.Columbia's heat shield was damaged in the impact and the shuttle broke apartduring reentry, killing its seven-astronaut crew. NASA engineersare still unsure of the exact cause of the latest foam loss, but have narrowedit to a few potential sources, shuttle officials said. "It lookslike it's going to be very unlikely that we're going to be able to just removethe...ramp and fly," Gerstenmaier said. Some tankstudies are underway at Marshall Space Flight Center in Huntsville, Alabama,while other non-destructive analyses will likely be moved from Michoud to KSCwhile the New Orleans facility rebuilds, Gerstenmaier added. Conditionsare improving daily at Michoud and Stennis, though only recently have recoveryteams managed to reach the external tank facility by road, NASA officials said.The facility was previously only accessible by helicopters, they added. "We'restarting to supply them by truck," Parson said. "Up until last night, theMichoud facility was cut off." Michoudsuffered roof damage when Hurricane Katrina struck, including the external tankstorehouse. One tank was damaged when concrete, knocked loose in the storm, hitit, Parsons said. "We haven'tbeen able to evaluate that damage," Parsons said, adding that cursory lookssuggest it's superficial. "We're trying to safe the facility." Tornadoesdamaged some roofs at the Stennis center, but overall the facility fared "verywell," Parsons said. While NASA'sfocus is centered on the hurricane recovery effort and displaced personnel, theagency is confident the storm will not severely impact plans to return theshuttle to flight and complete construction on the International Space Station(ISS). Many ofNASA's international partners are waiting for shuttle flights to loft their componentsto the ISS before the agency's three remaining orbiters are retired in 2010.Before the next ISS assembly flight - STS-115 aboard Atlantis - engineers mustcomplete their external tank modifications, and the Discovery orbiter must flySTS-121, NASA's second return to flight mission. "We'restill going to be able to accomplish our goals for a good station configurationfor shuttle retirement," Gerstenmaier said. "In our schedule and planning weassumed that we'd have some shuttle problems along the way." The agency alsoneeds to secure a return trip for NASA astronaut, and ISS Expedition 12commander, Bill McArthur. McArthurand Expedition 12 flight engineer Valery Tokarev are scheduled to launch towardthe ISS atop a Soyuz spacecraft late Sept. 30. Space tourist and scientist GregOlsen will also accompany the Expedition 12 crew to the ISS for a brief stay. WhileTokarev is slated to return on that Soyuz in April 2006, McArthur planned tostay aboard until May and catch a shuttle ride back to Earth. Shuttle officialssaid they are making contingency plans in case of a further delay. "We'll geta ride home for [McArthur] on a Soyuz," said Gerstenmaier. "We'll have a ride forhim."